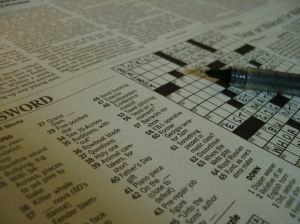 Solving cryptic crosswords impairs our subsequent ability to recognise faces, a finding that has obvious practical implications for the kind of activities eye-witnesses get up to prior to an identity parade. Michael Lewis at Cardiff University presented 60 students with 14 faces, one at a time, for three seconds each. Some of the students then read a passage of a Dan Brown book for five minutes, others performed a Sudoku puzzle during this time, some completed a simple crossword, while others worked on a cryptic crossword. The students were then presented with a further 28 faces and they had to identify the original faces among these. During this identification phase, the participants also continued with their allotted puzzle/ reading for 30 seconds between the presentation of each face. The students working on the cryptic crossword performed significantly worse at the face recognition task than all the other participants (68 per cent accuracy compared with 80 per cent for simple crossword, 76 per cent for reading and 79 per cent for Sudoku). Relative to chance performance, Lewis said this represented a 40 per cent reduction in performance for the cryptic crossword participants relative to the others. The finding follows other research showing face recognition is impaired after reading the small letters of Navon stimuli (pictured right) – these are images in which a large letter or symbol is composed of many tiny repeats of a different letter or symbol. Lewis speculated that both Navon stimuli and cryptic crosswords involve the suppression of obvious, irrelevant information – the large letter in the first case, or the literal meaning of a word in the latter case – and that this process could have a negative impact on face recognition. “This observation, however, does not explain how such suppression has such a detrimental effect on face recognition”, he said. Lewis, M.B. (2006). Eye-witnesses should not do cryptic crosswords prior to identity parades. Perception, 35, 1433-1436.